When you need to track your fleet operation remotely or outside of your CAD application, diagnose GPS or tracking related issues or replay historic fleet movements and deployments, use NSM Fleet Monitor to visualize your mobile data terminals or GPS enabled radios. NSM is a simple, clear, true real-time application that can be taken anywhere. With an easy to deploy low bandwidth secure web socket network interface, Click-Once client installation and fully persistent data storage, use NSM in operations from simple fleet monitoring to critical emergency call taking and dispatch. Built for public safety resilience and security, NSM is suited for both enterprise and government fleet solutions. Use out of the box support for input data feeds from MDC, Dimetra (LRRP via SDR) or Astro (LRRP via UNS/MUPS). Use the generic REST API to integrate your custom application or third party radio solution. Export data directly from the UI to either XML or CSV format. Create tasks and dispatch tasks to your fleet via the integrated task input windows. Easily identify locally created tasks vs those from your CAD operation. Implement a task dispatch receiver to assign tasks to your fleet via your mobile data terminals or Dimetra SDS Messaging. Display unit identifiers, logon information, location, speed, heading elapsed distance, time between location updates, distance between location updates and task assignments for all active or inactive units in one single filterable list. Display event identifiers, detailed event information, location, unit assignments, time between updates for all your currently active tasks or events in one single filterable list. Use the intuitive single line search facility to quickly filter your spatial and list views. Link your search to show either unit assignments by event criteria or event assignments by unit criteria. Use regular expressions to perform more complex searches such as ‘all units doing over 100 kmph’ or ‘all units with a callsign like …’. Display fast map tiles served up either by your own WMS or OSM compliant web map server or via a public map tile provider such as Google or Bing. Each client caches the map tiles locally ensuring frequently visited locations render fast and network overhead is minimized. 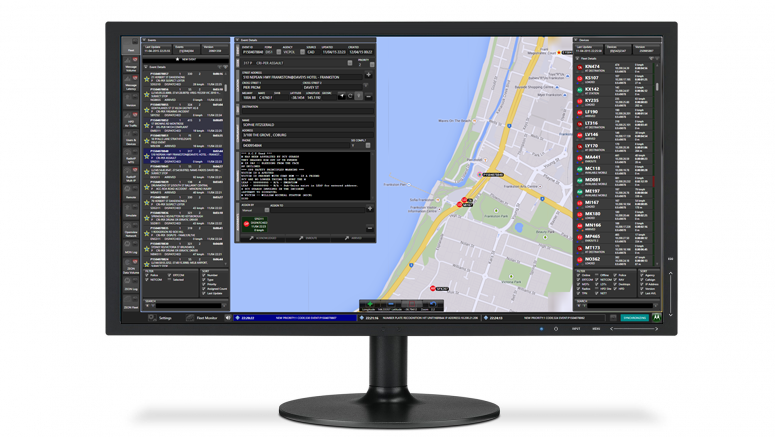 The NSM overlays symbols client side meaning fleet information is never published to a public mapping provider, maps are rendered fast and no special licensing models are required of public tile providers. Include your own private map tile server such as the comprehensive Open Street Map (OSM) for an entirely private fleet monitoring solution. Deploy your client software with customised shape files including points, lines or polygons of important locations, critical dispatch/coverage areas for example. Turn on and off these layers or set you individual client subscriber location to ensure your map always renders to the individuals needs. Include a custom filtered event ticker at the base of the fleet monitor to ensure fleet affecting events are signaled to operators. Include speech or signal audible alerts to flag an event even when the fleet monitor is not in view. CAD efficiency & response times – Improve mobile fleet productivity, performance and situational awareness with Computer Aided Dispatch functionality. Flexible deployments – Proven to reliabily track thousands of active vehicles and events in true real time over consumer grade wireless 3G public cellular connections, where NSM client workstations can be easilly deployed and upgraded using web based Click Once deployment. Visual replay – Recall critical event data and visualize it instantly on screen with quick replay functionality from any NSM client workstation. Open API – Use the NSM (REST) Application Programming Interface to integrate your custom application to perform tasks such as triggering new events from third party applications, assigning units or modifying unit and event properties. Export data directly via the API or from the NSM client workstation to either XML or CSV format. Internet ready – Access the service in real time, from anywhere, using bandwidth optimised – secure web connections. True real time visualisation – no caching – no polling – data visualised when it is received by the network. Real time device mapping via fast private tile based map services (based on Open Street map, Google Maps, Bing Maps or any other WMC compliant mapping service). Lifetime data recording, including one touch replay of device movements and event chronology. Proven technology, used internally by Motorola Solutions Managed Services in public safety solutions. Multi radio platform – Supports Tetra/Dimatra (via SDR), ASTRO P25 (via UNS) and Premier MDC Mobile Data based Systems. Permission based login – for allocating functionality to each login.